Got a hankering for coffee but can't stand the thought of waiting in line? 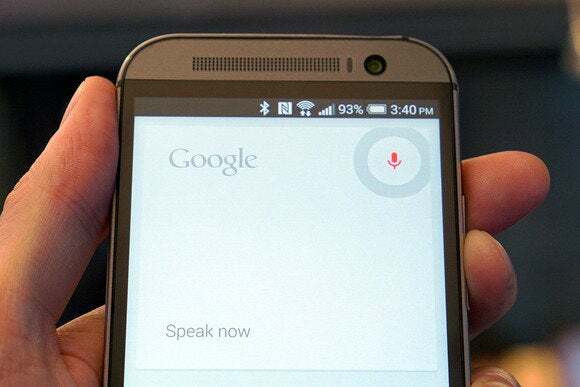 Google search on mobile can help you figure out if that's likely to happen. Finding the new feature is pretty easy. Let’s say it’s 8 P.M. on a Saturday evening and you’re hanging around Park Slope, Brooklyn when hunger hits. Your first thought might be to head over to the closest Five Guys Burgers and Fries location. How badly do you want that burger? So you search for “Five Guys Park Slope” and tap on the blue banner with the outlet’s name on your results page. This shows you to the location’s business details. Scroll down and you’ll find the seven-day graph. By default, it shows you the current day, but you can shift between days with a quick flick of your finger. Back to our imaginary scenario, you’ll see that Five Guys gets pretty busy Saturday evenings. Instead of burgers you might be better off heading to Antonio’s for pizza. The new popular times feature won’t work for every business you might frequent, but for those times you really don’t want to wait in a long line this addition just might save you some frustration. 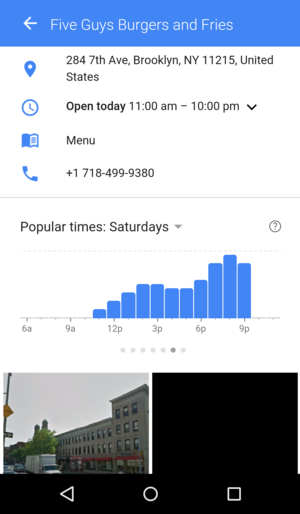 The impact on you at home: It appears Google is getting this information based on historical visits from other Android users. The search giant then harnesses all that crowd sourced data to provide a picture of a particular location’s peak hours. How accurate that information will be remains to be seen.